Today is one of those days. In my mind, I have the image of flowers floating in the sea while a Scottish bagpipe is heard, with that melancholy, sad song that touches the most sensitive strings of the heart. Each flower represents a person whose life was touched by cancer and one of those flowers has the name of Eduardo. While I see, the flowers floating in the sea, my eyes drain tears. There is no way to stop them as there is no way to stop the flowers that begin to sail with the current, each with their own destiny. Meanwhile, the bagpipe continues to play. 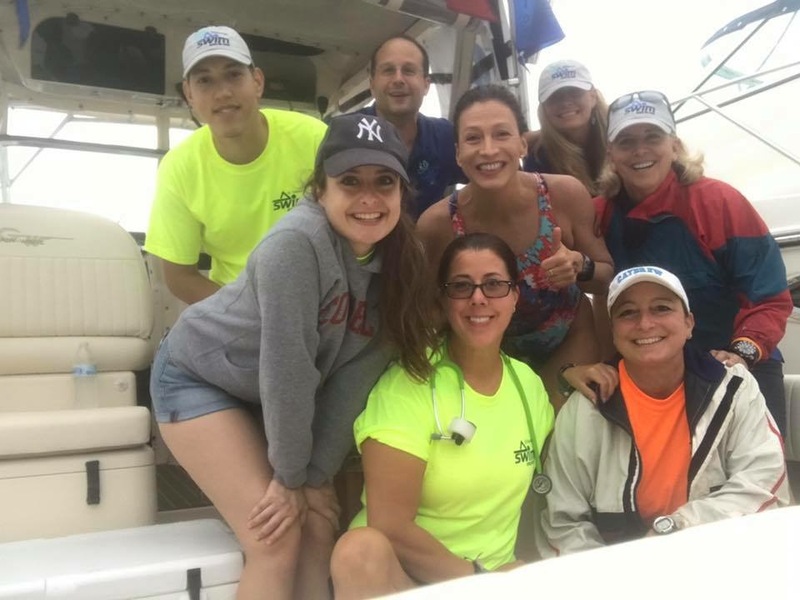 Three years ago, I wanted to participate in the Swim Across the Sound event, a 25-kilometer marathon swim that starts in Port Jefferson and ends in Bridgeport, Connecticut, and whose course is set across Long Island Sound. 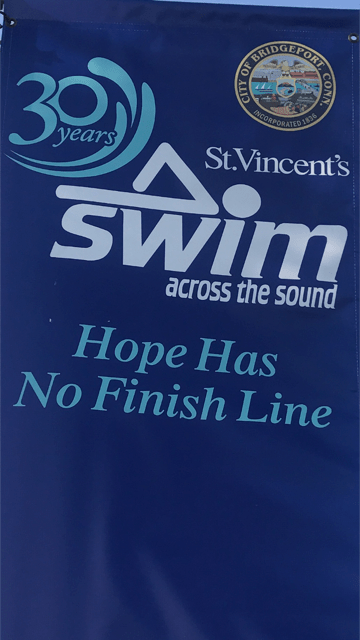 This event has been organized for 30 years to benefit the SWIM Cancer Center at St. Vincent Hospital and serves the most vulnerable community in the area, including people without health insurance. That year, there was a storm and they took all of us swimmers out of the water. When I got on the boat, I called Eduardo, angry and at the same time disappointed by the situation and he said, “There will be another moment to swim the Sound and you will return.” Yesterday, as I was ferrying to Port Jefferson, a storm started and I thought the story would be repeated. Indeed, there was a storm but it passed by quickly and the swimming event was carried out starting with an hour of delay, a lot of wind and light rain. As I jumped into the water I thought, “it’s just another storm,” and I started to swim. As I made my way across the Long Island Sound, I noticed that many boats were passing me. Even though I was putting in every ounce of effort, I could not make progress, much less pass any of them. My supply and refueling stops were fast, at most 30-40 seconds and after eight hours of swimming, regardless of how much or how fast I was swimming, I was not making much progress. It seemed that there was no way to overcome that current that had me stuck there, making all my effort be in vain. 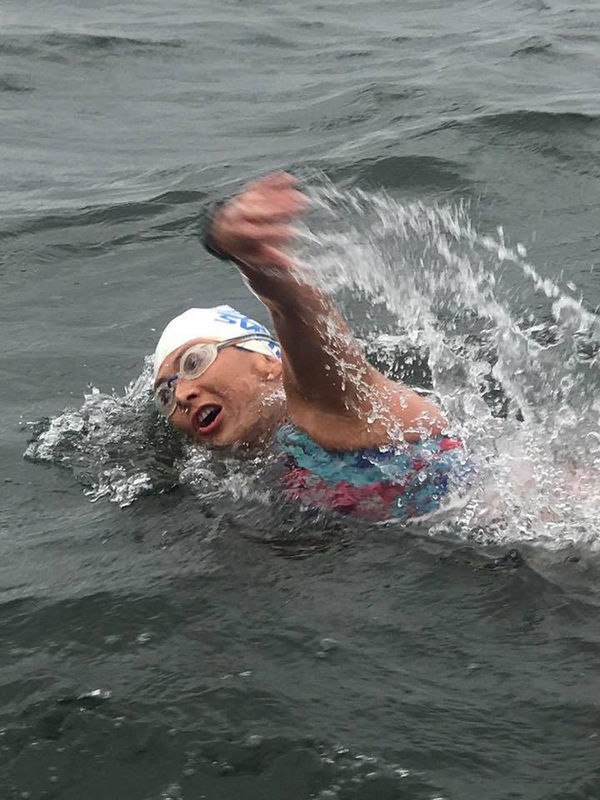 I did not stop swimming knowing that the time limit to finish was approaching and I only asked my captain, Kevin Blanco, to let me finish the swim even if I could not do it within the event’s time limit or official finish line. I just wanted to finish. When I entered the Marina, almost eleven hours after I had started swimming, I had so many intense mixed emotions. On the one hand, I was proud that I was about to finish but on the other hand sad, knowing that the time limit had passed and I would surely come out of the water in a place other than the intended goal. I was sad to think that I had not managed to swim in time even when I had not given up. I was thinking about this during my last strokes before reaching the exit ladder. I was telling myself: “You did not give up, you should feel very proud, you finished and even though there will probably be nobody waiting for you at the dock, keep this in mind always. You finshed.” This is what I was thinking when I held the ladder and as I started to climb, I heard shouts and cheers and once out of the water, with the goggles still on, I received the most special welcome I have had upon finishing a swim. Today in the morning, seeing the flowers floating in the sea, I thought that life does not give up, it only transforms and now these flowers sail the sea, because life does not give up and hope has no limit and no finish line! My gratitude and love to my very special and supportive crew!